The term 'Trayned Bande' can be traced back to the reign of the great warrior-king Edward I, when Parliament enacted legislation decreeing that every freeman between the ages of 15 and 60 years must be available to preserve the peace within his own county or shire. In the towns where the units were organized and located, they were known because of their periodic training as "trained bands". 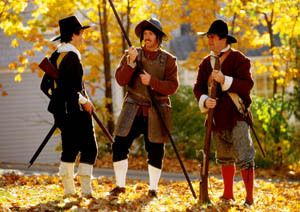 When colonies were founded in America, they set up the English practice of establishing trained bands. In the reign of Charles II, Parliament revised membership requirements, established pay and appointed officers, and the trained bands became known as "militias". Congratulations if you found your way here!